Large parts of the United States are experiencing a mild winter–which is a nice thing for some of us but not so great if you are a snow bunny—and as we approach the end of February here in Kentucky the weather remains pretty calm. 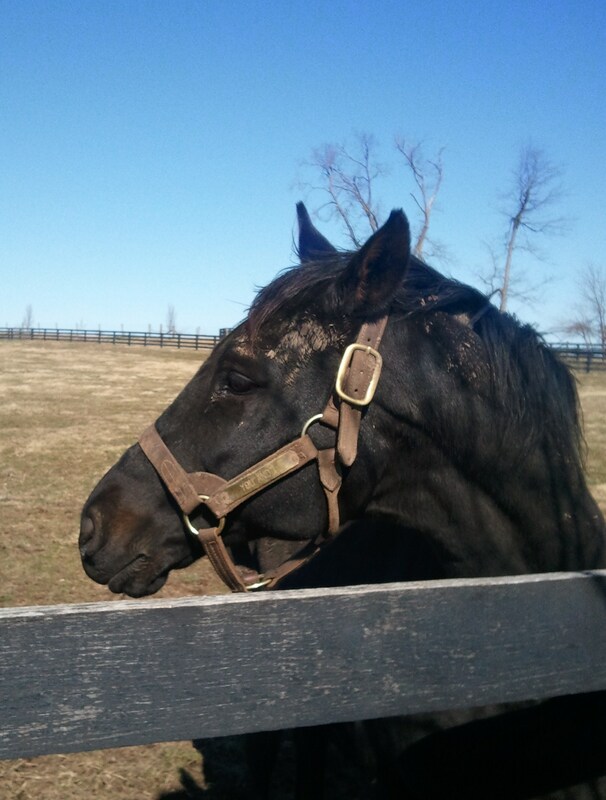 Today was nearly spring-like, with bright sunshine, temperatures in the low 50s, and the ever-present Kentucky wind. 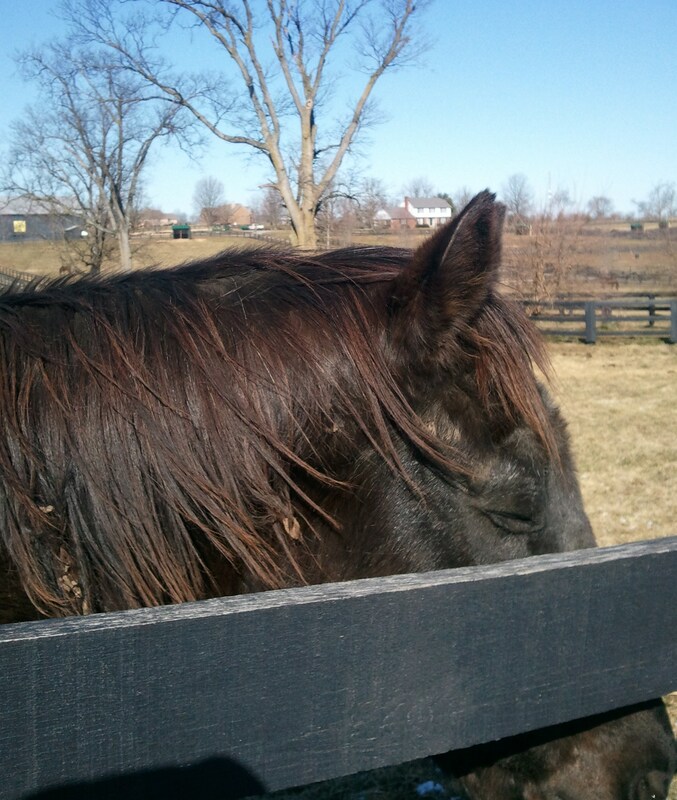 As we wandered the main farm today on our morning tour, we woke any number of horses from stretched-out-in-the-sun naps. But for some of the other horses—Dan, Flick, Pops, Ring and Commentator—it was a great day to play. My tour this morning consisted of a Cincinnati mom and her two daughters, in Kentucky for a “girl” weekend to visit the horses. The girls were dog people so Marley was thrilled, and all three of them were happy to wander around with me. I didn’t even have to carry the carrot bucket. As we left the office, both Swan’s Way and Fortunate Prospect were down for a nap. One of the girls was very concerned as she thought it was bad for horses to lie down. That is probably the most common question I get, and my answer is horses lay down all the time; you would, too, if you weighed 1200 pounds! By the way, once again Gramps has a grandson on the Kentucky Derby trail. His grandson Mark Valeski ran second in the Risen Star yesterday, a good start on the road to the first Saturday in May. As we headed down the hill, Gramps didn’t bother to get up to greet us, because well, he is 31 years old and he does as he pleases. 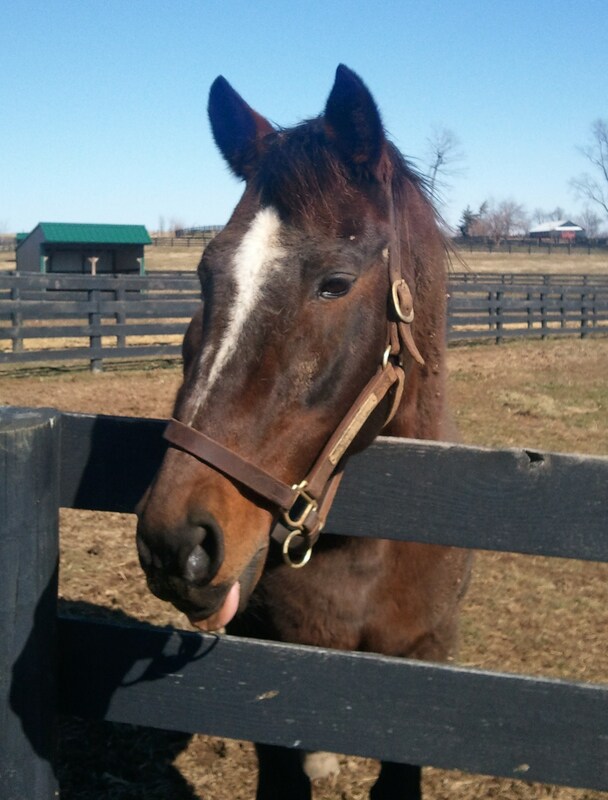 But Swannie heard us coming, took a few seconds to add a few pounds of mud to his coat, and ambled over for his share of the carrots and mints. The first thing I noticed is that winter hair is just beginning to come off, which seems early to me until I re-read my blog entry from last year at this time. I commented on the shedding winter coats then as well. So I guess the time is right. I also noticed a teeny, tiny dandelion flower blooming tucked in next to a fence post. Good signs, for sure. Gulch was napping (albeit standing up) on the far side of his paddock and wasn’t interested in us, but Clever came right over. He is a sucker for the girls and would have stuck around all afternoon to be fussed over. Ogygian was also too busy napping to care about us, but new Breyer model and celebrity Bull inthe Heather came right over, as did his neighbor and carrot competition Commentator. It’s kind of early to tell, but I thought perhaps Bull was rather more demanding than usual. The million dollar question: will Bull develop an even bigger ego? I’m thinking yes. And don’t think this whole Breyer thing isn’t bugging Tator, because I think he knows and I think he’s more than a little miffed! As we continued on our walk, we watched Dan and Flick rear up in mock battle, saw Commentator race and of course beat the golf cart, and spent a fair amount of time laughing at Special Ring working his lip trick. He started out with a few half-lip-flips, but quickly moved right into the full-on, nose in the air, look-at-me-now tattoo exhibition. He is such a show-off. Then Pops and Ring galloped up and down the hill a couple of times for good measure, and rolled in the mud as their finale. Taaa-daa! Kiri’s Clown, Sunshine Forever and Patton were all down for naps as we walked over to each of them. Kiri got right up for carrots, but Sunshine kind of peered at us and decided we weren’t the effort. He was lying curled up like a dog, but once he dismissed us he stretched out, plopped his head down and completely ignored us. So here is what happened: Patton, who was also lying down, got up, shook like a wet dog, and came over at a trot. 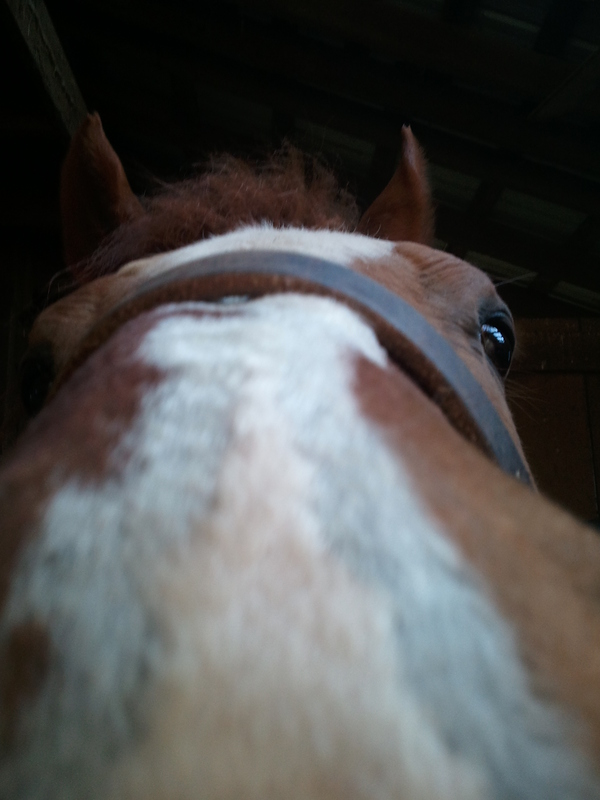 Within 30 seconds, Patton had won over the visitors and was smacking his lips over carrots, mints and kisses. You guessed it—it didn’t take two seconds before Sunshine was up and at the fence, waiting for his treats. Heaven forbid Patton should get Sunshine’s share of the swag! 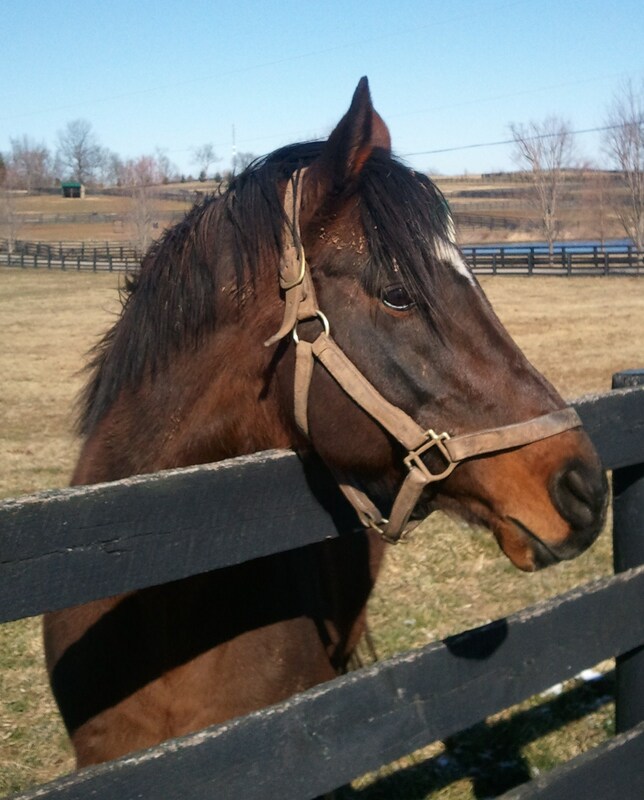 I’ve had some requests for information on Arson Squad, who is in residence at Old Friends but is not available for tours. 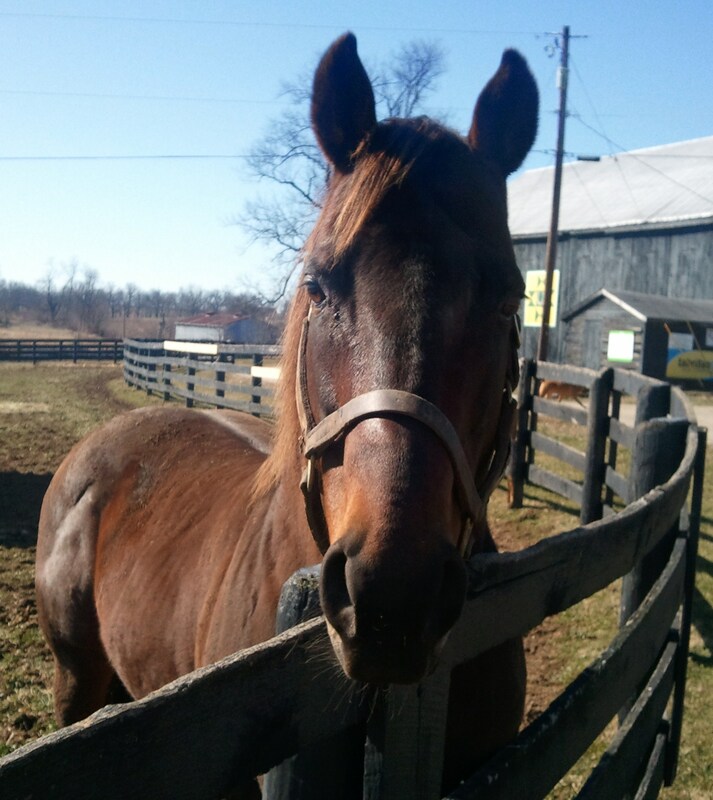 As you may know, Arson Squad’s owners recently retired him to Old Friends after he underwent reconstructive surgery on an injured front leg. He has multiple screws, pins and plates in his leg. His recovery in large part will depend on keeping him quiet and limiting his movement while he heals. But for those of you who want to know: he is a dark brown, almost black horse with a white star on his very pretty, elegant face. He is residing in a stall next to Marquetry, because nothing fazes Marq and he will be a good, sensible, calming influence on Arson Squad. I can say this: Arson Squad is comfortable, content and not in pain. He is adjusting very well; I look forward to watching him as he heals and is eventually introduced to his fans. This is the time of year when our tours start to pick up. We are all looking forward to introducing the horses to new visitors and reacquainting returning friends with their favorites. We offer tours daily–call the office for reservations at 502-863-1775. With bright blue skies and sunshine, it looked warmer than the 32 degrees it actually was today. No tours scheduled, but it was fun wandering around the farm and snapping some pictures. Of course, for every horse that came over and posed, there was another that couldn’t be bothered! 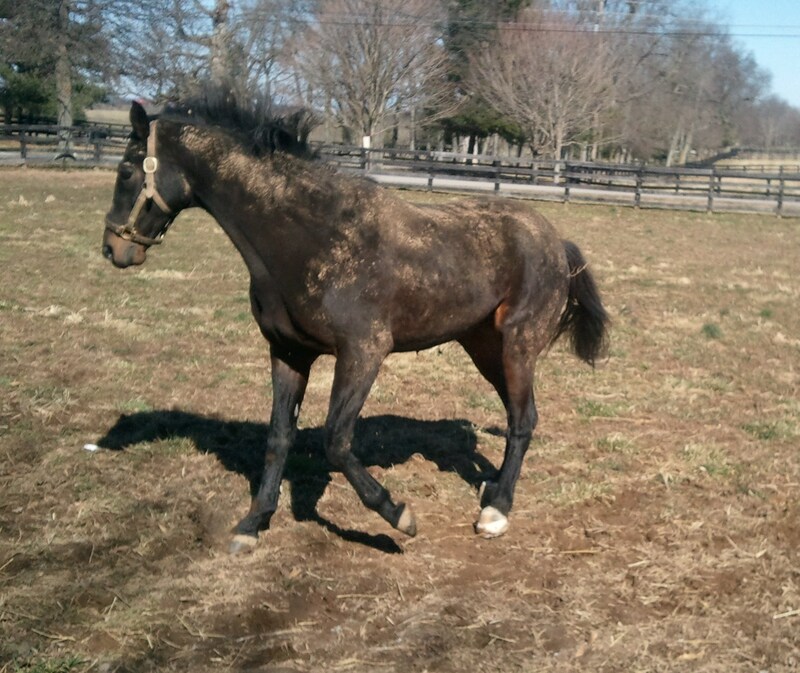 And for anyone who hasn’t seen just how muddy horses can be–take a look at Wallenda, showing off in the sunshine this afternoon! Winter has been pretty much a non-event in central Kentucky this year. Outside of a couple of blustery days early in January, for the most part we have seen warmer than normal temperatures and rain rather than snow. This past week saw temperatures rise to the mid 60’s, which is hard to believe. Nothing is frozen, and with plentiful rain the ground is not just muddy, it’s MUDDY! I gave a brief thought to taking the golf cart up to the back of the farm today, until Michael walked in with some friends and they were all muddied up. They apparently had the same idea, and ended up with the golf cart stuck in the mud. That pretty much ended my plans, and I stuck with low-tech but effective hoofing it around the front part of the farm. Of course, with only a few exceptions, most of the horses do love some mud. Right now, the mud is sticky, gluey and thick–in other words, perfect for rolling! I got a kick out of watching Gulch this morning as he “prepared” his mud spot. He pawed a perfect oval, correctly proportioned for his body. When the ground was nicely torn up and the mud good and loose, he dropped down right in the middle of his spot and rolled until he ground that mud as far into his shaggy winter coat as he could. When he got up, the formerly torn up spot was flat and dry. All the moisture was beautifully transferred to his body. He was so proud of himself! We rewarded him with carrots, of course, so I guess Gulch’s morning was just about perfect. When I first arrived at the farm this morning and looked around at the paddocks, it seemed most of the horses were napping. But as we walked around with the carrot bucket there seemed to be a lot of showing off going on. Afternoon Deelites, for example, is always ready to put on a show. He firmly believes it’s his duty to impress us with his awesomeness. I almost hate to tell him he’s handsome since his ego is large enough as it is, but he is pretty gorgeous. Pops and Ring met us at the fence for treats calmly enough, but as we walked down the hill they followed at a playful trot. Creator, once he decided to meander over, tossed his head and pretended to be all mean and cranky. Unfortunately for him, we now know it’s (mostly) an act! 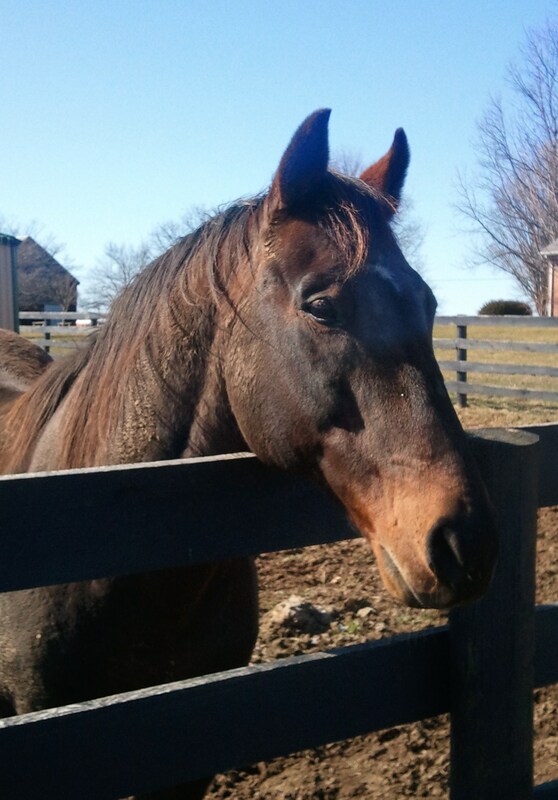 Prized was probably the biggest ham, following us along his fence at a canter with his neck arched. He moves beautifully; for an old guy he clearly has very few aches and pains to slow him down. Plenty of mud, though—Prized might have been the muddiest stallion out there today. Both Sunshine Forever and Kiri’s Clown took a few carrots from us, but rather than chewing both horses kept the carrots tucked in their mouths while they tried to get us to play. Kiri is quite a bit smaller than Sunshine but both horses will push against you to rub their faces. Today Sunshine was more interested in slobbering on me than knocking me over, and Kiri just wanted his face rubbed. Bull inthe Heather is gearing up for his second bout with fame, the first being when his picture was in Sports Illustrated back when he was a 3 year old on the Kentucky Derby trail. Now he is awaiting the soon-to-be released Bull inthe Heather Breyer model horse. I can’t even imagine the 2012 Breyerfest weekend at the Horse Park. That is always our busiest weekend, but this year? We’re going to be inundated with Bull’s new fans. Is Bull going to love this, or what? For those who are wondering about some specific horses—Marquetry is doing very well. 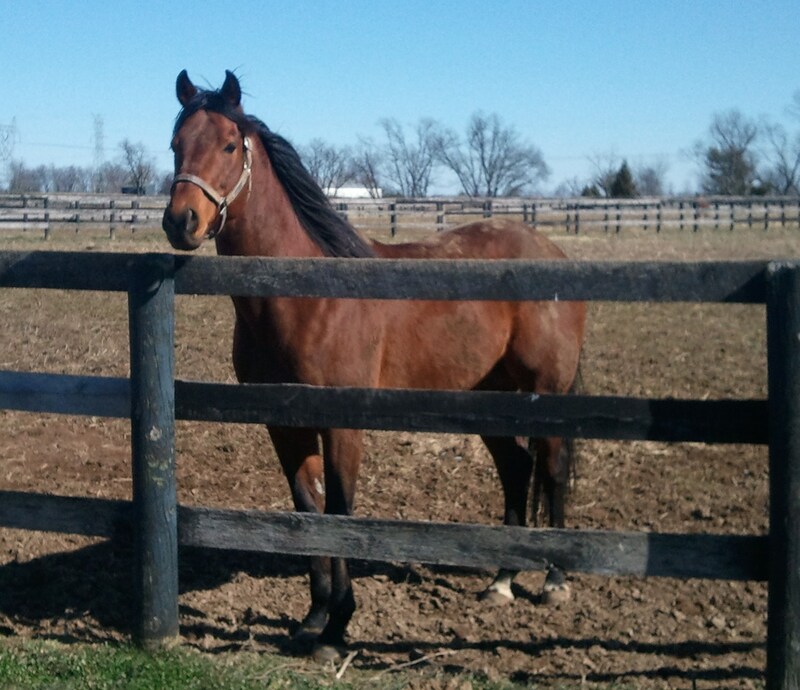 Diamond Stripes is adjusting to farm life nicely, and Fabulous Strike is a happy horse, too. Fortunate Prospect looks fantastic at 31. He seems like he could go on forever. 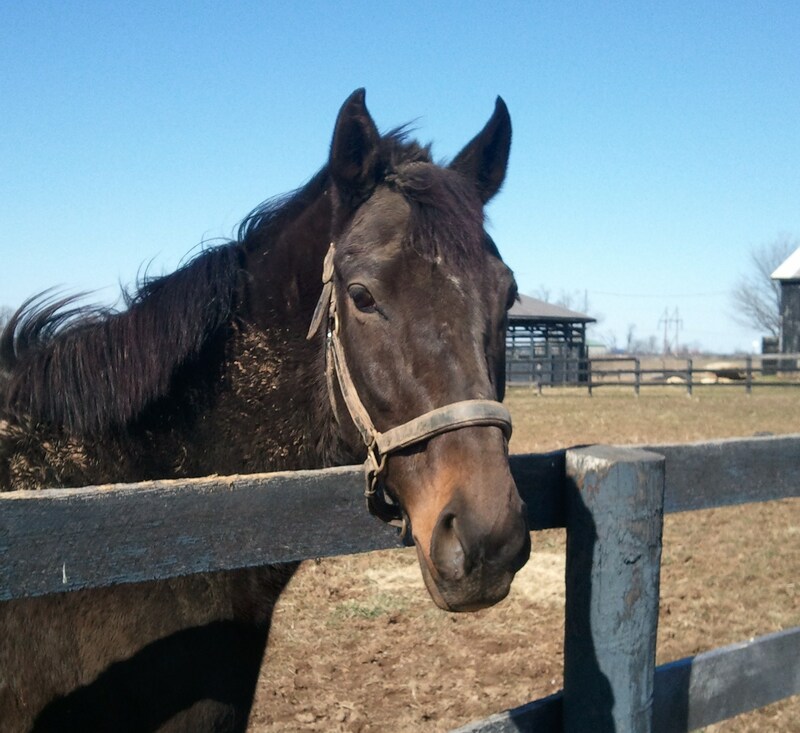 Stormy Passage is just so cute, and boy does he love his mud! Never saw a horse able to cram more mud onto his body. And my friend Wallenda just keeps on going. Personally, I think he looks great and I know he is as happy as can be. So even though it’s early February and Phil saw his shadow up in Punxsatawney, it seems like spring is not that far off. The days are getting longer, the sun is warmer and I’m starting to see new babies in the fields romping with their moms. At Old Friends, the gift shop is in the midst of a facelift as we prepare for spring tour season. We continue to offer daily tours–you can make a reservation by calling the office at 502-863-1775. We hope you can visit soon, but in the meantime thanks for spending this Sunday with Old Friends.